I just gave some seemingly contrary advice. “You need to be more solid, steady, dependable, consistent – you’re all over the place,” I told an experienced IT Project Manager friend who is having one of those blips where nothing goes right. “Great advice David! Well done! 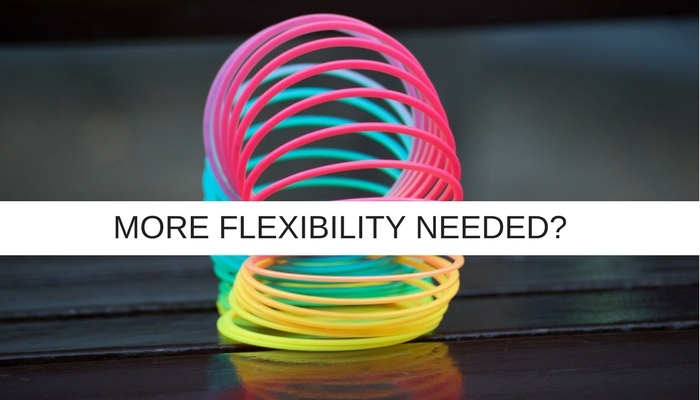 You need to be both solid and flexible. You GENIUS!” The look on the face of my friend said. But yes, actually. Why not? Into the search box type “solid”. Scroll down to Antonyms. Does it anywhere suggest that solid and flexible are opposites? No? Thought not. Now do “steady”, “dependable” and finally “consistent”. Is “flexible” the antonym of any of these? It’s one of the biggest misnomers in IT Project Management that consistency and flexibility cannot co-exist and it robs IT Projects of potential success. Solid and consistent does not mean rigid or stubborn any more than flexible should mean erratic or volatile. Becky Tornes Project Manager with Viget (Twitter @beckybitz) just published a really nice post titled “How to Be A More Consistent Project Manager”. I think it’s worth a read. Hear, hear! Who wouldn’t want Becky on their Project team? Communication is key to bridging the solid/flexible gap. You will be familiar with the fairy-tale story of Leicester City who beat odds of 5000-1 last season to win the English Premier League. This term they are fighting relegation and as I write have just sacked the manager who masterminded such a seemingly impossible achievement. What’s changed? Well, they lost a key team member but they won games convincingly last year without him so that may be a red herring and a convenient excuse (one that I hear in many IT Project Management teams too). What changed most, and let’s couch this in our terms, was the process. Last year Leicester played each game in a roughly similar and highly effective way. It was, give or take, the same eleven players on the field each week and they all knew what they were doing. The trouble is that the other nineteen teams cottoned onto this and came increasingly prepared. It got harder but Leicester stuck to their “process” and the result was that 5000-1 title win, a victory parade and Smooth Radio flying a plane with a congratulatory banner overhead. This season it seemed like a different team, a different formation, a different playing style every week. Leicester’s players reportedly complained about the manager to the board after he decided to change “everything”, from tinkering with the line-up to replacing chicken burgers with pasta as the post-match meal. The key difference was that when you watched the eleven players on the pitch, unlike last season, they didn’t seem confident that they knew what they were doing. They were flexible but had lost their solid core and consistency. Project Management techniques, processes and methodologies are evolving all the time in line with business needs – you have to be flexible and adaptable to swim in such fast-moving waters but the key to this flexibility lies in the solid mastery of the basics … planning, preparation, communication, scheduling, budget, etc. Once you have the basics in place you have the flexibility to shift and adapt to the demands of your project. Budgets, for instance, having a contingency budget for unanticipated challenges buys you the freedom to draft in resources when needed. Efficient scheduling of resources allows you to know which you can switch to fight fires elsewhere within your portfolio without harming the project to which they were originally allocated. Clear lines of communication established in calm times deliver exponentially greater value during a crisis. Master the basics and buy yourself some scope to be flexible. A Project Management Office Assessment to establish any basic capability gaps is an exercise worth carrying out regularly, either doing it yourself or getting a fresh pair of eyes to take a look will pay great dividends. Once you have identified any gaps – plug them using your in-house resources or by accessing the Project Management as a Service market for solutions. In his book “The 7 Habits of Highly Effective People”, Stephen Covey shared a story about once asking one of his employees to undertake an urgent project. The guy said, “Stephen, I’ll do whatever you want me to do. Just let me share with you my situation.” After showing Stephen Covey his list of projects, he asked: “Which of these projects would you like me to delay or cancel to satisfy your request?” The result was Stephen Covey went off to find another crisis manager – he didn’t want to be the spanner in the works of one the most efficient team members in the business! The section in Covey’s book about “What It Takes To Say No” is a must read for anyone working in IT Project Management. In conclusion, solid and flexible, at first glance seemingly opposite concepts but in IT Project Management terms almost symbiotic! It’s not a case that they can co-exist, more that they must! Be solid and flexible and who knows one day your local radio station may fly a congratulatory plane above your head. Previous The IT Sector Doesn’t Need ‘Just Another Recruitment Consultant’ – Next Time Choose A Partner.